The “Measuring the Water Cycle” group has an open position in snow remote sensing. The position is related to SnowEx (NASA GSFC page, Eos piece), a multi-year airborne and field experiment to explore methods of remote sensing snow water equivalent (SWE). Email durand.8@osu.edu if interested, but please consult with the OSU Graduate School Admissions site (link) and international students please check guidelines for English test scores here. Durand can advise students in three possible graduate programs: the School of Earth Sciences, Civil, Environmental and Geodetic Engineering, and the Environmental Sciences Graduate Program. This position would begin in August, 2019. The student would work as part of Durand’s grant 80NSSC17K0200, entitled “Characterizing accuracy of an advanced snow water equivalent retrieval algorithm applied to airborne microwave remote sensing measurements”: project abstract below. The student will be applying the algorithm of Pan et al. (2017) to radar measurements. Strong analytical skills are necessary. The ideal candidate would have a M.S. degree with experience in estimation theory, experience with remote sensing of the cryosphere, and snow fieldwork experience. However, if this sounds like something you are excited about please apply! The GRA is expected to attend iSWGR field and modeling snow schools as they are available, and to participate in future SnowEx and other field campaigns. 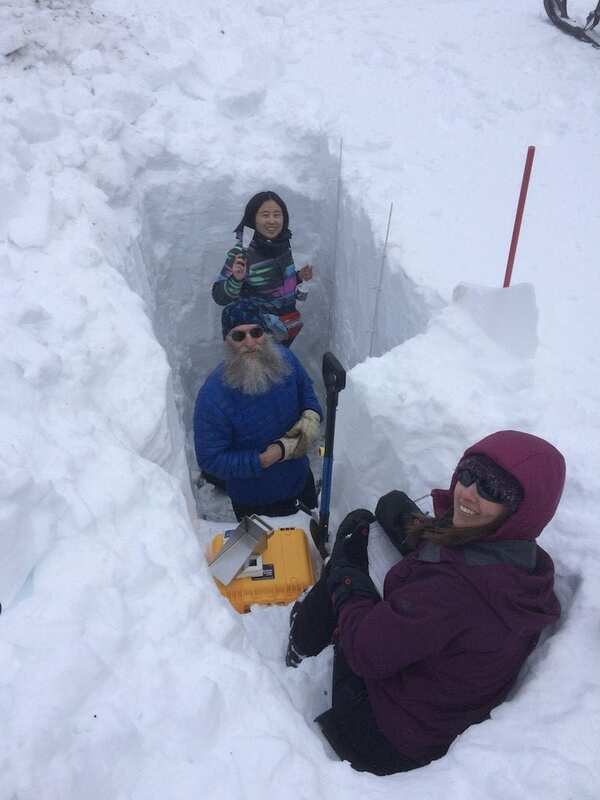 From background to foreground: group alumna Jinmei Pan works with Glen Liston (CIRES) and Carrie Vuyovich (NASA) to measure snow properties including specific surface area (SSA) at SnowEx 2017, Grand Mesa, Colorado. Photo: M. Durand. Spaceborne synthetic aperture radar missions (SAR) to measure snow water equivalent have been proposed by NASA, ESA, the Canadian Space Agency, and the China National Space Administration for mapping snow water equivalent (SWE). In comparison with passive microwave measurements, SAR is capable of far higher spatial resolution. However, field and airborne measurements made over the past decade have revealed that the relationship between the observed radar σ0 and SWE is not straightforward; snow microstructure (or grain size) and layering have been found to play an important role. For example, the algorithm proposed for the ESA CoreH2O mission required grain size to be known a priori to within ±20% accuracy in order to achieve accurate SWE retrievals. Recent years have seen major community-wide advances in three areas: 1. Methods for grain size measurements have matured significantly. Microstructure properties such as snow specific surface area (SSA), which controls the scattering of both active and passive microwave radiation, can now be measured in the field and in the laboratory. 2. Advances in backscatter modeling have been made; these models are increasingly parameterized by measurable quantities. And third, significant field and airborne datasets of radar backscatter and snow properties have been collected. Physically-based SWE retrieval algorithms allowing for multiple snowpack layers are now possible. Next-generation NASA Cold Lands Processes Experiment (NGCLPX) field activities to occur in winters of 2019, 2020 and 2021 along with the 2017 SnowEx experiment are expected to include radar (and perhaps also passive microwave) measurements. We propose utilization of the newly-developed Bayesian Snow Water Equivalent Estimation (BASE) algorithm, as part of these experiments. The BASE algorithm is flexible, relying on relatively modular physically-based radiative transfer models. BASE provides a quantitative estimation of the SWE. A major advantage of the scheme is that it estimates SWE along with SSA and snowpack layering simultaneously; thus each part of the retrieval can be compared with field observations. We propose to support NGCLPX as follows: 1) Aid in planning and preparation for the NGCLPX field activities, in order to represent the perspective of the microwave retrieval algorithms, and help to guide and contribute to writing the science plan and implementation plan; 2) Utilize the SnowEx and NGCLPX data, along with existing datasets, and working together with the rest of the SnowEx and NGCLPX team to make a major contribution to defining expected SWE accuracy based on well-documented radar retrieval algorithms; 3) Illustrate extension of the computationally-expensive BASE algorithm to future spaceborne applications by constructing a simple artificial neural network emulator of the algorithm.